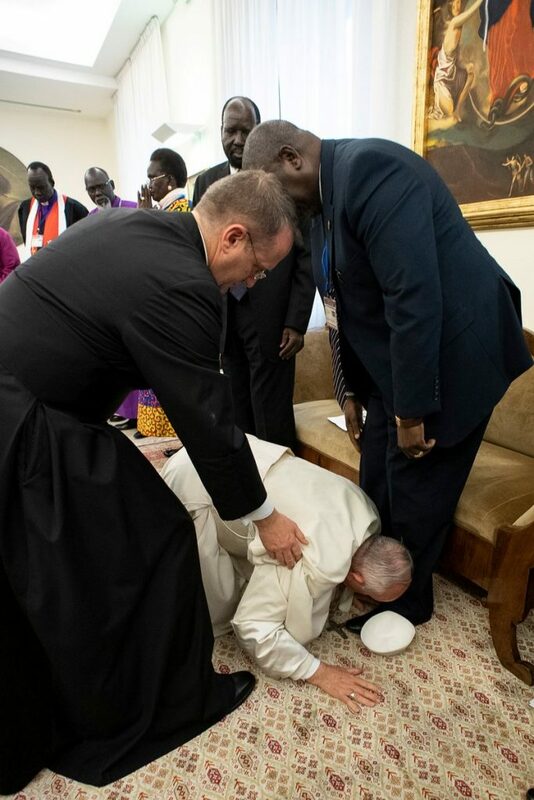 Pope Francis on Thursday kissed the feet of South Sudan leaders, President, Salva Kiir, and the opposition leader, Riek Machar, imploring the two men to maintain the tenuous peace that exists between them. Naija News reports that the dramatic gesture took place during a spiritual retreat by the two men at the Vatican. The development came only hours after the military in neighbouring Sudan ousted its longtime leader, President Omar al-Bashir, after 30 years of authoritarian rule. South Sudan gained independence from Sudan in 2011, however, in December 2013, the country had devolved into a civil war that killed at least 400,000 people and displaced millions. Kiir and his former vice president turned rebel leader, Machar, signed a peace agreement in Ethiopia last September. The Vatican has for years sought to foster peace in South Sudan, and it saw an opportunity in the latest armistice.